Cruising along old US 66 on our way out of Albuquerque, we saw Carlisle Street - so of course we took pictures. Stopped at another Stuckey's (with fireworks!) near Santa Rosa, and picked up more important GooGooey items. While attempting to mail a postcard from Cuervo, NM, we were chased by dogs - couldn't they wait until the mail's picked up? Entered the Texas Panhandle and found cheap gas ($1.089) and a Denny's in Amarillo (but no au jus - this is a bad thing). As the skies darkened and the rain began to fall, we saw the largest cross in the Western Hemisphere on the plains east of Amarillo. On a highway related note, we encountered lots of two way two lane sections on I-40, with miles of temporary barrier - apparently a lot of full depth pavement replacement and bridge replacement going on. Spent the night at a motel which seemed like an interesting (and cheap) place to stay - it was the Big 8 Motel in El Reno. Turns out this motel was featured in the movie "Rain Man" (only transplanted to Amarillo), but we enjoyed it nonetheless. On our way through Oklahoma City, we drove by the site of the Murrah Building. We didn't stop, because Richard felt it just wasn't right - such a place in his mind shouldn't be the kind of tourist attraction it had become. :( The day improved with some good ice cream at a Braum's in Tulsa, plus a stop at the local Cheapo Depot for more pillows for the truck. Lunch this day was above the Will Rogers Turnpike in the World's Largest McDonald's near Vinita, OK. We wandered off I-44 into Kansas, and enjoyed a stop at the Riverton Market in Riverton, KS. An entire room of this place was devoted to Route 66 souvenirs and memorabilia, and we found a few interesting items here. We also met a number of "Route 66" tourists retracing the old highway here. We told them to enjoy the signs in Arizona - after all, they're the best! Back on I-44, we started seeing signs for "WALNUT BOWLS". After 50 miles of these signs, Suz turned to me with a wild look in her eyes and says "We have to stop for walnut bowls!" So, the signs directed us to the "walnut bowl outlet store capital of the world" in Lebanon MO, where we bought... walnut bowls. Decided to spend the night in Lebanon, so we found a nice older motel known as the Munger Moss Motel. 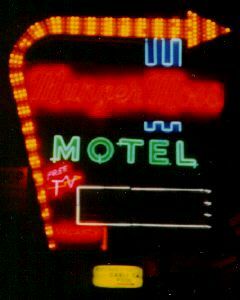 Turns out this motel is another famous Route 66 icon - we just keep finding them without looking for them! We left bright n' early from the Munger Moss and headed east. 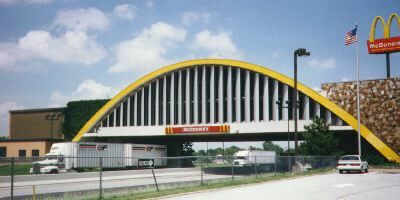 Stopped for incendiary devices near Meramec, then saw the Gateway Arch in St. Louis, surprised that McDonald's hadn't already bought it and painted it yellow. Then onward along I-55 and a very quiet I-72 thru Illinois, with an interesting lunch in Champaign/Urbana (site of Arizona's glorious 16-0 win over Illinois in which no offensive points were scored). Onward for a short jaunt into Indiana, where Suzanne bought a Tamagotchi, a small electronic "pet" which requires feeding, playing, and attention. After this, a nice twilight dinner in Grant Park on the Chicago lakefront. The final miles into Milwaukee were unfortunately punctuated by a fiery accident in which a car went under a semi-trailer. Fortunately, we didn't need to stop and assist. Being on the National Committee on Uniform Traffic Control Devices (NCUTCD) Bicycle Technical Committee means one thing - *work*! Our committee must essentially rewrite Part IX (Bicycle Facilities) of the Manual on Uniform Traffic Control Devices (MUTCD - the definitive standard for signing, pavement markings, and traffic signals in the US) in the next 2 1/2 days. Today consisted of non-stop technical meetings from 8 AM until 6 PM with a short working lunch break, then back in our little Motel 6 love nest developing new MUTCD diagrams and drawings until 2 AM! Richard was still trapped at NCUTCD all day and most of the night, as the committee tore apart (they said "refined and perfected") his drawings and text. In the meantime, he did get the chance to see the vendor displays, fully stocked with the usual goodies from 3M, Stimsonite, etc. and picked up samples for the team. Suz, abandoned back at the Motel 6, walked down to the movieplex and watched "Batman and Robin" and "My Best Friend's Wedding". After yet more late work in the technical committee, we got together late that night for dinner and saw to our horror that our trusty Truckasaurus had blown its heater core, spilling coolant onto Suzanne. After watching the Batman movie earlier, she immediately began to worry about mutating into the infamous villain "Auntie Freeze" from exposure to this fluid. ;) The evening finished with a beautiful view of the huge fireworks display at Summerfest down by the waterfront. The day began with us driving together to downtown Milwaukee. Richard disappeared into the general National Committee meeting, while Suz went sightseeing downtown. At the full Committee meeting, the technical committee gave an excellent presentation (thanks in part to Richard's signs & drawings). The preliminary indications are that the revisions will go to the sponsors relatively unscathed, but we'll see what happens when the comments come back. After the meeting, we poked around downtown. 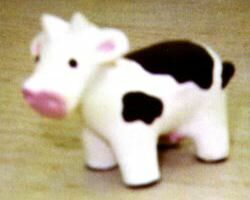 At a store called "Celebrate Wisconsin", we bought cute little squeezable rubber cows designed to relieve stress and "udder" souvenirs for the team and family. Afterward, we snagged some great frozen custard on Highway 41. Finally, back to the room, where Richard had the privilege of successfully performing a heater-core bypass on the truck. We mooved north along the Lake Michigan shore of Wiscowsin, seeing more cattle than we could cownt, and headed up to Manitowoc. 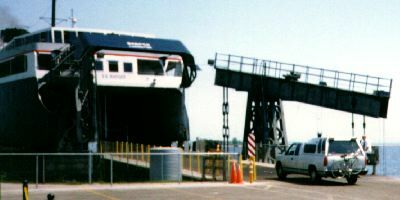 Here we (including the truck) boarded the S.S. Badger for a ferry voyage across Lake Michigan to Ludington. The trip was smooth and scenic, and we enjoyed the fresh lake air. Upon disembarking in Ludington, Michigan, we traveled up to Manistee and Onekama, where Richard discovered that his driver's license was still back at the Kinko's in Milwaukee (as ID to rent a computer for printing the graphics). Kinko's apologized and said they'd immediately send it up to Suz's mom (Tuesday's stopover) No problem - we hope? This day began as we headed toward Traverse City, where we kept hearing people complaining about the "heat wave". We looked at the 84 degrees on the thermometer, and figured they were nuts. About this time, Richard's "internal compass", which served him well so far in this trip, "flipped over" and he started thinking north was south and east was west. Once he got used to this, no problem, but we hope it flips back before we get home! Westward and southward, er, eastward and northward, through Kalkaska and Grayling to Sea Shell City USA for more souvenirs & gifts, then into Mackinaw City, where we viewed the mighty Mackinac Bridge, featuring the longest total suspension bridge on Earth (8600'), and bought bridgeorabilia. We crossed the "Mighty Mac", and took a side trip to the famous Mystery Spot, where we watched our senses get confoosed and our wallet get lighter. After a quick trip into Sault Ste. Marie for a replacement headlight and pizza, we spent the night at a nice motel on old US 31 just south of Sault Ste. Marie, where we watched Canadian TV discuss the heat wave - "could get up to 30 tomorrow, eh?" We ventured over into Sault Ste. Marie, Ontario, Canada for the international leg of our tour (and breakfast). The problem was it was Canada Day, and very little was open. After turning $20 into almost $27 at the currency exchange, we did finally find a nice little restaurant and enjoyed (Canadian) bacon & eggs. Then back to the USA (where was that driver's license when we needed it for the nice Customs agent?!) and began our journey across deepest darkest Yooperland (the Upper Peninsula of Michigan). While in Marquette, we stopped at the WLUC-TV Rainbow Room, and bought "Yooper Mooses" for friends, Then, in Ishpeming, we encountered "Da Yoopers Tourist Trap", chock-full of double-decker privies and books about deer hunting and Finns. Our next-to-last stop was at the best place for pasties in the whole U.P. and after indulging in this meat and potatoes in a crust regional delicacy, we finally ended up at Suzanne's mother's home in the woods of rural Trout Creek, Michigan. This day was wet and rainy, with temperatures in the 60s (yesss!! :) First thing noticed was that Richard's beeper is out of range. This is probably a good thing. Richard spent the day relaxing his aching back (from 3000 miles o' driving) and writing up leftover NCUTCD issues which needed responses before the 14th. Suz reminisced with her ma and did laundry (thanks!). During a break in the storms, we walked outside to enjoy the greenery & beauty of this part of Upper Michigan. After a few minutes, we were relaxed, refreshed - and about a quart low on blood from the local skeeter population. We knew there was a reason we lived in Phoenix... Altogether, a very uneventful day - and all the more enjoyable for it. This day was also rainy, with a high of only 51 degrees (we definitely don't think we're in Arizona anymore!). We traveled up to L'Anse to meet Suzanne's sister Vicki Martinac, her husband Pete, & their kids Lindsey and Peter.They treated us to lunch at their home, nicely perched right on the shore of Lake Superior. After that, it was up the Keweenaw Peninsula to Houghton, where we toured Suzanne's (and Dave Elack's) alma mater, Michigan Technological University. After dinner at the Kaleva Cafe, a down-home type diner in Hancock, we spent the night in Suz's old dorm, Wadsworth Hall, so Richard could better understand the living conditions that shaped her life (only without the homework and beer). This very nice 4th of July was spent exploring the Keweenaw Peninsula. First, we drove by the "Snow-o-meter", which shows the average, maximum, and past year's snowfall for the Keweenaw - the snowiest place east of the Rockies. Can you say "lake effect snow"? For example, last year (1996-1997) saw almost 23 FEET of total snow! After this, we went to Phoenix. Actually Phoenix, Michigan, a small town on US 41. Doesn't seem to have as many traffic problems as the other Phoenix, though... After this, we made the obligatory stop at the beginning/end of US 41 near Copper Harbor (the other end is in Miami, FL). 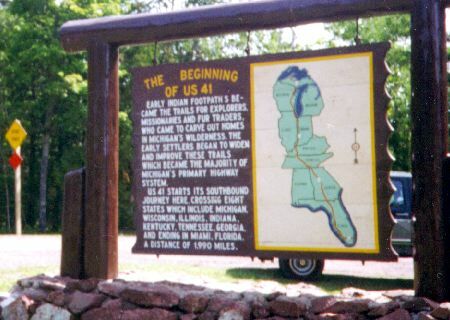 US 41 has been a frequently used route on our trip, appearing previously as Lake Shore Drive in Chicago and 27th St. in Milwaukee. As we stopped at the Copper Harbor stop sign, a shirtless guy in an Indian war bonnet walked up to the truck and asked for donations for the evening's fireworks. Not being one to argue with semi- clothed Native impersonators, we donated a dollar. Much of the rest of the day was spent rolling along the rugged shore of Lake Superior, driving up Brockway Mountain for a panoramic view of Lake Superior, and passing through a number of small towns celebrating Independence Day with parades, barbecues, picnics, and other all-American traditions. Later that evening, we did our own bit of celebrating with some incendiary items we'd picked up in Missouri, then enjoyed some romantic moments watching Nature's own fireworks - fireflies flitting among the pines and flowers. 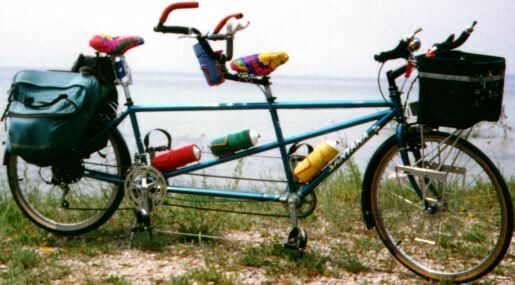 This day was spent exploring Trout Creek on the tandem, enjoying the green rural countryside by human, instead of truckasaurus, power. We toured Suzanne's childhood haunts, then rode out to scenic Agate Falls on the Ontonagon River, enjoying the amenities at the M-DOT roadside park at the falls. Side Note: Michigan DOT has a very large number of rest stops on their highway system such as this one, which aren't as fancy as, say, Sunset Point, but are very nice to visit (just hold yer nose in the privies) The evening hours were spent looking through Suzanne's childhood memorabilia, and figuring out how to stuff as much of it as we could (especially the John Travolta 8-tracks) into the truck for return to Phoenix. 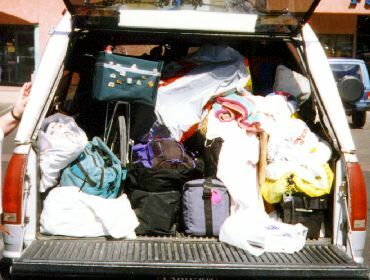 We may end up looking like something out of the Beverly Hillbillies, but we'll get it all home somehow! We began with fond farewells to Suzanne's mom and once again we were on the open road. Our first stop was to see the World's Fair Load of Logs and Suzanne's high school in Ewen. Another obligatory stop was to ogle the 50 foot tall fiberglass statue of Hiawatha in Ironwood, Michigan - and buy postcards and souvenirs, of course. This was followed by an uneventful trip along US 2 across northern Wisconsin. We enjoyed a nice lunch on the waterfront in Duluth, Minnesota, with entertainment provided by the vertical lift bridge. After a tour of the Maritime Museum (if I hear the name "Edmund Fitzgerald" again, I'll send them to the bottom! ), we were southbound to Minneapolis. The only problem was I-35 from Duluth to Minneapolis on this Sunday very closely resembled southbound I-17 from Cordes Jct. to Phoenix, just without the hills. There were at least two 5+ mile long backups for minor accidents, where the delays lingered long after the accidents cleared, due to the large volume of vehicles. 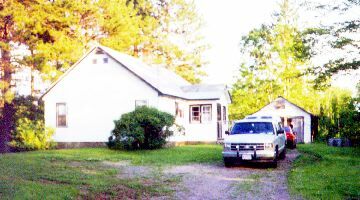 :( We stayed overnight at the home of Mike Carlisle, (Suzanne's brother) in Cedar. Mike, his wife Joan, and their kids Scott and Kacey treated us to a very nice dinner in the great outdoors - until the mosquitoes got the better of us. Fun in Minneapolis started with a visit to the Mall of America. 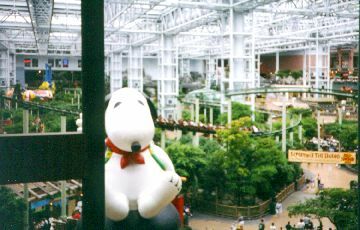 This place has four levels and nearly 500 different stores and restaurants, plus an amusement park in the center (Knott's Camp Snoopy). We spent over 5 hours there, bought keen stuff for my nephews/nieces, and we STILL didn't get to see the 2nd level or the amusement park! We left in a good mind to take a nice afternoon tandem ride along the Cedar Lake Trail, a 4 lane divided bicycle "freeway" near downtown. The minor problem was, when we exited the climate controlled, insulated microenvironment of the mall, we saw it was now raining HARD, as in small farm animals, so no tandem ride. :( We consoled ourselves with pizza at the home of one of Suzanne's long time college friends, and enjoyed inflicting our "new house" video on another victim. The longest day of this trip started out a bit behind schedule, and got stranger from there. We plowed our way through Minneapolis' underachieving drivers, and finally hit the open road. I-35 south to Albert Lea, then I-90 west through the croplands of southern Minnesota. At Blue Earth, we stopped for the obligatory photo with the 60' fiberglass Jolly Green Giant - this isn't just fiberglass, folks, it's genyoowine American art. We made a southward detour into Iowa, where the folks were nice and the premium gas was cheaper than the regular ($1.159, if you're interested) - presumably due to ethanol fuel tax breaks. In Sioux Falls, South Dakota, we visited Augustana College, Richard's mater's alma mater. Pressing ever westward, we discovered corn nirvana in the fabulous Corn Palace in Mitchell, S.D. This building, decorated entirely in grain products, has served for almost a century as the local auditorium, gymnasium, and of course, tourist trap. According to Richard's mom, the Corn Palace always was a big draw - she spent many nights there herself dancing to the best big bands of the era. After finishing our sweet ears, we looked at our watches and noticed it was 7:30 PM already, and we had 300 miles still to go before bedtime. We traveled the vast plains of South Dakota at high speed, and arrived in Wall at 10:04 PM. 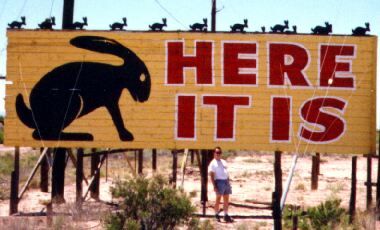 The problem was the world-famous Wall Drug, and the entire town of Wall (except the bars), closes at 10:00 sharp. We were not amused, and discussed going all the way back to Minnesota to selectively edit every Wall Drug sign we'd passed. Overcoming our vandalistic urges, we again turned westward, and got into Rapid City at 11PM, where we paid almost $70 for a room at the Motel 6. Rapid City was notable for two things - one, all the people in the hospitality industry (motels, etc.) were very rude to us, and all the normally rude people (postal clerks, mini-mart attendants, etc.) were exceptionally polite. Wasting little time, we hauled out of Rapid City and toward the Black Hills. Rolling through Custer State Park, we encountered a strange sight - a wide spot in the road where everyone stopped and rolled down their windows, somewhat like an inspection station. Only in this case, the "inspectors" were wild donkeys, who gave Suzanne a big wet kiss on the hand when she rolled down her window! We approached Mount Rushmore via US 16A, a road so twisted it has 3 "pigtail bridges", where the road loops completely over itself. 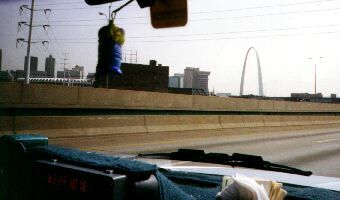 This road also has two tunnels whose portals offer excellent views of the memorial. We stopped at Mt. 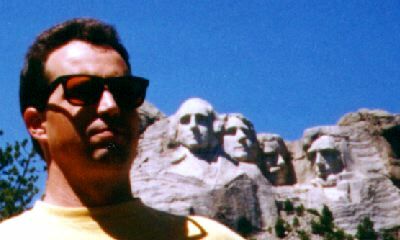 Rushmore for the customary taking of photos and getting of Siouxvenirs for the co-workers. These included a whole herd of squeezable soft "stress buffaloes", cousins of the stress cows we accumulated in Milwaukee. Further down the road, we feasted on buffalo burgers in Custer - actually very tasty and enjoyable. We wandered southward into Nebraska, and met a very nice lady staffing a tourist information center near Crawford, who filled us in on all the great things to see and do in that state. Perhaps next time - we're running late again! Many different animals to see on this stretch - cows, sheep, (live, real) buffalo, even a herd of llamas! We entertained ourselves this afternoon by using the truck's PA system to moo back at all the Nebrascows we passed along the way - though many of them did seem puzzled as to how we cows could afford such a big truck! After buying an electronic parrot at the Sinclair station in Gering (now that's another story), things got very interesting when we were caught in an intense Midwest thunderstorm south of Scottsbluff, with horizontal rain and lightning hitting within yards of the truck. The evening concluded with dinner in Cheyenne, Wyoming, and finally a comfortable motel room in Greeley, Colorado. Today, we viewed the still snow-patched peaks of the Rocky Mountains as we drove south on I-25 to Denver, then westward on I-70. Today's interesting animal sighting was seeing signs warning of bighorn sheep, then seeing a whole group of these majestic woolies browsing right on the freeway shoulder! We're in serious mountains now, and they take their truck signing seriously - large overhead signs saying "TRUCKERS YOU'RE NOT DOWN YET / 4 MILES OF HILLS & CURVES TO GO". 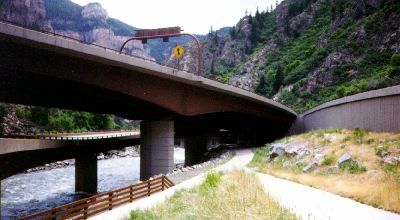 After ducking under the Continental Divide through the Eisenhower Tunnel and passing by the endless ski resorts, we stopped at Glenwood Canyon, one of the most spectacular stretches of Interstate highway ever built. Riding our tandem along the "world's most expensive bikeway" paralleling I-70 along this stretch, we got an up-close view of the Colorado River and the bridges and tunnels conveying I-70 through this canyon. Following this, we had a late lunch in Glenwood Springs, a town that seems so filled up with people wanting to "get away from it all", that it's more frantic and crowded than Phoenix! The day ended with us rolling into Grand Junction, our stop for the evening. OK, it's time to go home - no more room for souvenirs! Began Richard's 34th birthday by sleeping in late and shaking off the effects of the previous night's misdeeds. We stopped at the Oasis Casino on the way out of Mesquite and were rewarded by some rather generous slots. Drove into Las Vegas - checked into the Imperial Palace, a Strip hotel which nicely combines affordability with classic Vegas tackiness. Saw some cross-country cyclists cruising up the Strip as well - drivers were remarkably polite to them. Now came the other important part of the trip - starting to plan our wedding (yes, in Las Vegas). We found a very nice and professional wedding consultant who had good contacts for hotels, catering, and of course knew a great Elvis who would be perfect for our special ceremony. After this, dinner at the Rio's buffet - a 30 minute wait in line followed by far too many food choices, but of course this is a good thing. 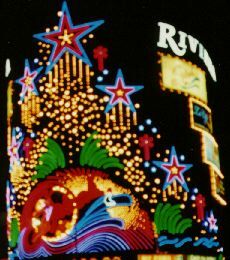 We ventured down to Glitter Gulch and were wowed by the Fremont Street Experience - in classic Vegas style, they built a roof over one of the world's most famous streets and made it a tourist trap. Cool. Finished off a very enjoyable birthday by cruising the Strip. With all the lights and scenery, we can believe what a Las Vegas traffic engineer once told us - "the biggest problem we have is getting the driver's attention in the first place". Getting out of the Imperial Palace was a bit harder than getting in. We waited 10 minutes for an elevator, then were enraged when every elevator opened to a scene resembling a Japanese subway - only more crowded. Had to haul the luggage down and up many flights of stairs instead. Spent a bit more time scouting out hotels and restaurants for our upcoming shindig, then finally down I-515 and US 95 leaving Las Vegas. Rolled into Needles, California to see if the temporary Arizona 95 sign I planted there was still up (yes), and then we indulged in Thrifty ice cream - hey, we were in our 19th state! Rolled down US 95 (not to be confused with AZ 95 on the other side of the river), finally re-entered Arizona for good at Parker, and continued down SR 72 and I-10 back into Phoenix. This stretch was enjoyable since it gave us a chance to look back and reminisce about all our adventures over the past 3+ weeks, and savor our final few miles of the journey. Pulled into the driveway around 8:30 PM MST, and then we were done (except for a few hours of unloading and unpacking, but hey, that was later). ... and we're glad we could share it with you all. All text and images ©1996-2005 Richard C. Moeur. All rights reserved. Unauthorized use of text and images is strictly prohibited. Refer to Standard Use Agreement for details.